It’s like Sharknado is real! 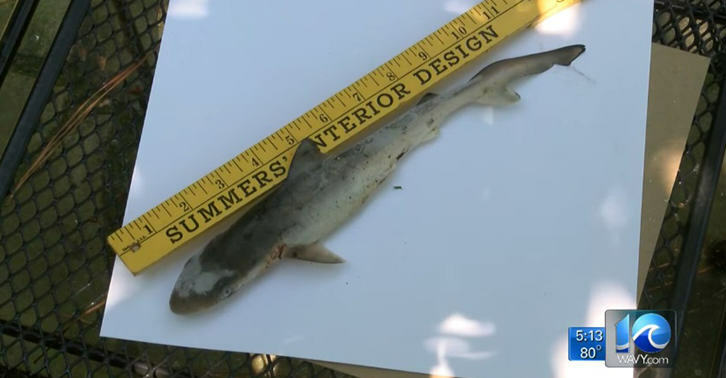 A family in Virginia Beach had a bit of a shock, when they discovered a 13-inch dogfish shark (better known as a sand shark) in their garden. The kids found it, and they came upstairs and they were all excited and said, ‘We found a shark in the backyard. There’s a little mark on his side where the talons probably went in, and it’s a little bloody on the side where the talons had poked him. Hopefully not too many more will be falling from the sky. Sue is apparently going to keep the shark in her freezer for a while, to show off to her friends. She isn’t sure whether the family will then bury it, or throw it away. It’s a bit too big to flush down the toilet, to be fair.